Music on the Forbes Lawn from 4 – 5 and 6 – 8:30; and at the Mill River from 5 – 6. 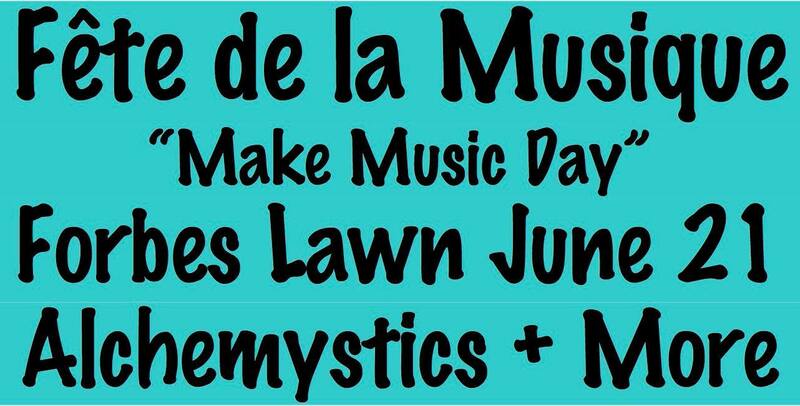 Northampton joins the worldwide celebration of music on “Make Music Day”, started as La Fête de la Musique in France. It’s part performance, part participation. Come enjoy the music, and start to plan for a bigger event next year. Fun for all ages! Would you like to join in? AEIOUkes ukulele club will be hosting a sing and play along at 6 pm. We’ll be playing six songs; if you’d like the music for them, email <musician@downtownsounds.com> to get the music, and you can join in! The Alchemystics fuse reggae and hip-hop to form a beat-laden mold of world conscious groove music. Interested in growing this event for next year? Contact Joe Pater (pater@umass.edu) to join the mailing list for people interested in helping make this event happen on a bigger scale in Northampton in 2018. ← Outer Stylie back at Bishops!